“While former Prime Minister Margaret Thatcher is a divisive figure in the UK, many people in Japan regard her as an icon. So why are they fascinated with the Iron Lady? Grantham has no tourist attractions dedicated to its most famous daughter but that does not stop visitors from around the world coming to see where Margaret Thatcher grew up. Japanese people regularly visit the premises where her father once ran his grocery shop in the Lincolnshire town, now occupied by a natural health and chiropractic centre. “It is not uncommon to see Japanese tourists having photographs taken outside the building,” said Sandra Good, who owns the business. “She’s huge,” said Jayne Robb, the museum’s general manager. She is so popular with international visitors – particularly those from Japan – that the museum is in the process of fitting its displays with QR codes, a type of barcode. These can be scanned with mobile phones and the text can then be translated into Japanese or other languages. So why do people say they have come to the museum? “From what we can gather, obviously she’s a strong, powerful woman, and that’s quite a novelty still in that Asian culture,” said Ms Robb. Her rise to power from relatively humble beginnings also makes her interesting to Japanese visitors, said Ms Robb. “She literally was a grocer’s daughter from a humble little market town corner grocery shop,” she said. “I think they find it particularly fascinating; rising from the ranks, so to speak. “They just see this incredibly tenacious, substantial woman achieving. “They are always asking me questions. I think they want to know what she was like as a child. Mr Sawamura recently visited Grantham himself to write a column for his newspaper, which sells millions of copies every day. He said there were further reasons why Japanese people look up to Baroness Thatcher. “Japanese population is looking for having strong leadership after prolonged political turmoil. We have (had) different prime ministers almost every year since 2006,” he said. “Also we are gradually fed up with a sort of populism. There seems to be some shift of opinion among Japanese. “They prefer the political figure who might seek unpopular politics but are firm on political belief rather than someone who pleases electorates but deliver nothing. OPINION As a former ESOL teacher in Japan, I know there aren’t that many “famous” British names you can mention that Japanese people recognise. Mention Margaret Thatcher however and most students and adults in an otherwise shy and reserved English conversation class will burst into life. She’s a unique and inspirational figure to many in Japan, reaching her position and succeeding in her role nationally and internationally in a way most women – and indeed many men – can only aspire to there. Japanese politicians tend to be non-descript, usually elderly, men and the parties are countless and confusing, many accused of corruption or collusion. Most people on the streets feel utterly disconnected from the political system and are cynical of its actions and motives. Governments appear slow to act and lacking inspiration – so you can see why Thatcher’s leadership-style appears to be at least fresh and different. Margaret Hilda Roberts was born October 13, 1925, to Alfred and Beatrice Roberts in the market town of Grantham, Lincolnshire, England. Her parents ran a grocery business and lived in an apartment above the shop. They were Methodists who were very involved in the local congregation, raising Margaret and her older sister Muriel in an atmosphere that emphasized self-help, charity, and personal truthfulness. Alfred Roberts was a local councilor in Grantham and a Conservative, and the family would often discuss current political issues. Just as Chamberlain had had his umbrella and Churchill his cigar, “Maggie’s” physical and metaphorical prop was her handbag. It contained crumpled notes full of facts and figures that could floor an interlocutor at 20 paces. “She cannot see an institution without hitting it with her handbag,” another observer wrote. The “handbagger”—prime minister for 11 years, six months and 24 days (1979-90)—turned around the ruinously ailing British economy of the 1970s and shook the nation out of its demoralized slough. She broke the mold—she was the first woman prime minister in Europe and the longest-serving head of government in Britain in the 20th century. She achieved iconic status in the Conservative Party and, as the country’s representative, internationally. “Thatcherism” became a label not just for her aggressive “conviction” politics but also a byword for the changed spirit of the 1980s. It’s a paradox, then, how much Thatcher was an Establishment outsider. She herself noted, in her autobiography The Path to Power, “I was often portrayed as an outsider who by some odd mixture of circumstances had stepped inside and stayed there for eleven and a half years; in my case the portrayal was not inaccurate.” By virtue of her social and nonconformist religious background she was an outsider in the patrician Conservative Party. By her heretical economic views she was a minority voice. By her individualism in the notoriously clubby world of politics, she generated suspicion. By her behavior in the European arena, she made heads of state bristle. By her very handbag, that symbol of femininity, she stood out from the male crowd of politicians. And by the fact that she wielded it with such masculine force she seemed an aberration of genteel womanhood. What shaped such individualism? Margaret Hilda Roberts was born October 13, 1925. Her father, Alfred, a self-made man, ran a grocery with his wife, Beatrice, in the provincial Lincolnshire market town of Grantham. They had an elder daughter, Muriel, born in 1921. Home was, Margaret recalled, “practical, serious and intensely religious.” Indeed life revolved around Methodism, with its churchgoing and music. Young Margaret became an accomplished pianist. This childhood living over the shop was “an idyllic blur,” with customers coming and going, Margaret helping to weigh out sugar, tea and coffee. The grocer’s daughter learned the basic tenets of economics, and from her mother she absorbed the efficient, make-good-and-mend housekeeping of the self-respecting middle class, virtues accentuated by World War II privations. Her father was an upstanding figure in the community, a lay preacher, an independent town councilor and later alderman. “Individual responsibility was his watchword and sound finance his passion,” Margaret remembered. From him she claimed her integrity—and a fondness for homespun aphorisms. “Never do things just because other people do them” was a favorite, and it was to stand the Grantham girl in good stead. The family was “highly political,” and Margaret, aged just 10, could be found folding general election leaflets for a local Conservative candidate. At Kesteven and Grantham Girls’ (grammar) School she was a diligent but not star pupil; blessed with logic and determination, she shone in the debating society. She took elocution lessons—a pre-requisite for getting on in the world. Hers was also a dreamy nature. She loved Rudyard Kipling, the patriotic poet of British Empire, and the exotic worlds beyond Grantham that he portrayed. And when the cinema arrived in town, she was entranced by Hollywood romance, reflecting that maybe it was a “fortunate restraint” that she was not allowed to watch films too often. Margaret won a place to study chemistry at Somerville College, Oxford, in 1943. She cut a rather serious, slightly lonely figure: work, religion and, increasingly, politics filled her time rather than socializing. In 1946 she became president of the Oxford University Conservative Association—only the second female to hold the post in its history. Strange, perhaps, that a middle-class grammar school girl should be drawn to an essentially public school-dominated party. But its dicta, such as self-reliance, appealed to her. Hers was also a dreamy nature. She loved Rudyard Kipling, the patriotic poet of British Empire, and the exotic worlds beyond Grantham that he portrayed. And when the cinema arrived in town, she was entranced by Hollywood romance, reflecting that maybe it was a “fortunate restraint” that she was not allowed to watch films too often. …When she left Oxford with a second-class chemistry degree, she joined BX Plastics near Colchester to work in research and development. However, she knew her true ambition was to be a member of Parliament. She got her wish, after a struggle, in 1959 when she was elected Conservative MP for Finchley, north London. It had been a busy decade post-Oxford: in 1951 she wed Denis Thatcher, a well-to-do businessman and divorcé 10 years her senior. Early married life was “very heaven,” and in ensuing years in a series of homes in London and Kent she enjoyed interior decorating, gardening and collecting porcelain. Denis’ income meant Margaret no longer needed to earn a living, and she studied law. In 1953 she gave birth to twins, Mark and Carol; by the time they were 6 months old she had passed her bar exams. “While the home must always be the centre of one’s life, it should not be the boundary of one’s ambitions,” she liked to say. Fortunately, the Thatchers could afford a nanny to allow this. The London Evening News heralded Margaret Thatcher’s entry into Parliament with the headline “Mark’s Mummy is an MP Now.” Women were a rarity at this level of politics—just 25 of 630 MPs—and Thatcher was given various shadow cabinet positions in “women’s” areas such as pensions. In the 1970 Conservative government under Edward Heath, she became secretary of state for education and science (1970-74). Sadly, neither her father nor her mother had lived to see this success. “The fifties marked the start of a major change in the role of women,” Thatcher reflected in her autobiography. In the male preserve of the House of Commons and in the cabinet she felt isolated. Her strident tone, perhaps an overcompensation as she tried to prove herself, further alienated male colleagues. Yet there were plus-points to being different. Blonde, attractive, always immaculately dressed and a zealous worker, she stood out and was for some while a media darling. The tide turned when as education secretary, forced to cut her budget, she stopped the provision of free milk to schoolchildren over the age of 7. Tabloid headlines raged “Mrs. Thatcher, Milk Snatcher” and asked if she was the most hated woman in Britain. She was deeply upset….Behind the scenes, Thatcher had an awesome work ethic. She slept only four hours a night and “living over the shop” at 10 Downing St. suited her (there’s a delicious irony in a grocer’s daughter running a “nation of shopkeepers”). She quickly mastered briefs in minute detail and was intolerant of “woolly” thinking. Yet, despite popular opinion to the contrary, she could be persuaded by others’ views—if well argued. Thatcher’s home life, indeed her career, had the firm anchor of her husband Denis. The media affectionately portrayed him as a gin-swilling, golf-playing buffoon, but he fulfilled his role of consort to perfection, content to support, a silent smile on his face. He had helped give the Grantham girl social confidence, and his money had allowed her to chase her ambition; his own success meant he felt unthreatened by her achievement. He encouraged, advised, gave the arm that consoled, and he alone could call late-night meetings to a close, tapping his watch and reminding, “Margaret, time for Bedfordshire.” In the morning, Margaret would cook his breakfast. She also doted on her son, Mark; relations with Carol seemed a little less close…. Margaret Thatcher and Thatcherism often evoke visceral love or hate. She was a role model for individualism and the success of the individual who worked hard—not always an easy trajectory in a nation of team players where traditionally it’s the playing, not the winning, that counts. Some said her policies legitimized selfishness. Feminists murmured that she failed to help other women break into public life—women were notably absent from high office in her governments. But that missed the point of her individualism, and she led by example. Her legacy, like her life, is one of paradox. A force for change, she saved her country from the economic mire and made it governable again, but threw the Conservative Party into turmoil. She altered national attitudes: After monetarism there has been no return to Keynesian economics, and Britain is no longer the sick country of Europe. She consolidated the Atlantic Alliance and helped create the dynamics of the post–Cold War world, but left the Tory Party—and the country—deeply divided on Europe and integration into its union. However these legacies play out, Margaret Thatcher will be seen as an icon of the 20th century and one of Britain’s outstanding peacetime prime ministers.” End of excerpt. In the last few days several commentators have reminded us that the Thatcher government was not only ideologically committed to free markets but also pragmatic in its approach. Mrs Thatcher understood perfectly well that the ‘free markets’ do not arise spontaneously – they have to be created. Take for example her privatisation of the utility industries. Mrs Thatcher and her advisers understood that simply transferring a public sector monopoly to the private sector would not automatically result in vigorous price competition. The privatisation of British Telecom required a revolution in the regulation of industries that had previously been considered ‘natural monopolies’. Instead of arguing over Thatcher’s legacy, the Coalition ministers hoping to introduce choice and competition in our university system through variable tuition fees should take note: universities won’t compete over prices for students until the reward structure is changed. To date, this lesson has been ignored. This is because of a fundamental misconception about higher education which makes it appear different: in 1979 it was impossible for most people to conceive of competition between providers of electricity or gas; in my experience, is it hard for outsiders to understand the extent to which universities do not compete. Yes, in many respects the global higher education market is intensely competitive. Research-intensive universities compete to produce the best research and they compete for the best students. And yes, the market for students is also competitive. Competition for places at top-ranked universities is a far more pronounced feature of higher education today than it was a generation ago. But universities simply do not compete on the basis of teaching or price. For example, in London the price of a one year taught masters in economics at University College is £14,250 at the London School of Economics is £22,176. Why? After all, the content of these courses is almost identical. The price difference depends almost entirely on differences in the prestige of these two departments. The higher fee is a result of a longer history of outstanding research at LSE. It is almost universally assumed that if universities compete to attract the most talented students they must do so on the basis of their teaching. They do not. The problem arises because both research and the academic ability of students are relatively easy to observe – we know which universities have produced the best research and we know which universities recruit the most academically gifted students. We have no equivalent way of assessing the teaching these universities offer. Just as the utility companies have been forced to publish transparent tariffs, universities must be required to make this essential element of the university experience less opaque. Today there are few people who would recommend the renationalisation of the utility industries. However, this competition was created by a government that was truly radical in its approach. Choice and competition cannot be taken for granted. The removal of ‘unnecessary regulations’ does not on its own guarantee success. On her side of the Atlantic, this three-decade reform enterprise really did start with Margaret Thatcher, and I doubt it would have continued through changes of party, prime minister, and education ministers had the movement not been fundamentally right-headed, as she was on pretty nearly everything she touched. She set up the commission which produced the Warnock Report on special educational needs, and the legislation based on the report introduced the concept of statementing to secure appropriate provision for children with additional learning needs. Her government funded the most lavish programme of technical and vocational curriculum development the country had ever seen. She did not introduce local financial management of schools – that had been done by local authorities such as Solihull – but the 1986 Education Act extended financial management to all schools. She did not introduce parental choice – which still does not exist as a legal right in England – but the 1981 Education Act gave parents the right to express a preference on which school their children should go to. She introduced the first statutory entitlement to a broad and balanced curriculum England had seen. Her 1988 Education Act introducing this national curriculum was, at the time, the largest single piece of legislation Parliament had enacted, though she subsequently regretted the excessive detail the act had introduced. She introduced national testing at 7, 14, 11 and 16. The ‘City Technology Colleges’ introduced in 1988 prefigured City Academies; ‘grant maintained schools’ – for all practical purposes revised as converter academies in 2010 – were harbingers of autonomous schools. She abolished tenure for university academics. Sir Peter Scott, professor of higher education studies at the Institute of Education, University of London – and editor of the Times Higher Education Supplement while Lady Thatcher was prime minister – said “her main legacy was the 1981 cuts in university funding, which set the pattern of squeezing the unit-of-resource that continued until after the election of the Blair government in 1997”. John Akker, deputy general secretary of the Association of University Teachers in the 1980s, said Lady Thatcher’s “unprecedented” cuts to higher education meant it “was not a golden age for universities”. “At the time, people regarded the period as an unmitigated disaster for universities,” he said. “People should realise how close we came to several universities actually closing. Without the good sense of staff and university leaders, there would have been mass redundancies across the sector. In the Conservative Government Manifesto of 1979, Thatcher discussed the need to promote higher standards of achievement in basic skills, “We shall promote higher achievement in basic skills. The Government Assessment of Performance Unit will set national standards in reading, writing, and arithmetic.” In the Education Act of 1980, Thatcher enacted policies which gave public money for children to go to private schools and gave parents greater power in governing bodies and admission at schools. Echos of Thatcher’s policies can be seen in the United States in debates over school choice and voucher programs. School reformers in the U.S. are seeing choice models take off and strongholds of teacher’s unions in areas weakening. “…she was a deeply moral thinker, and the moral superiority of the free market was central to her thinking. She made the case for it like no other major political leader. The no-nonsense small-town grocer’s daughter learned, by careful study of the work of F.A. Hayek and Milton Friedman, both of whose lectures she attended, that her instincts about hard work, market competition, thrift and a sound currency were exactly the blast of oxygen Britain needed to save it from slow asphyxiation by the trade unions. The unions’ many supporters in the media and popular culture failed to recognize that big labor’s demands were unsustainable in the long run — Britain could no longer maintain coal, steel and shipbuilding without massive subsidies that simply transferred wealth from productive industries to moribund ones. Moreover, a country’s ability to keep increasing the standard of living depends on more growth, more efficiency, more output per hour worked. The nationalized union-run industries were a drag on everyone’s advancement. Mrs. Thatcher came to power 1½ years before Ronald Reagan won election as the US President, and she immediately began to implement her governing program. During that memorable eleven years, including smashing electoral victories in 1983 and 1987, Dame Margaret revived the British economy and then she took on and defeated Arthur Scargill and the coal miners union. In foreign matters she sent the storied British navy to slap down the impertinent Argentines in 1982, she worked closely with President Reagan (and indirectly with Pope John Paul II) in efforts to undermine and sink communism in Eastern Europe, and she continued to stand with the USA through the Cold warand beyond by sending British combat units to fight in the first Gulf War of 1990-91. “Thatcher had little sympathy for universities. She was inclined to see universities as bastions of privilege and dilettantism, generally radical politics and producing graduates unprepared to enter the real world of work. Her views were partially a matter of cost. She insisted that university could no longer continue. In 1981, a 15% cut over three years was imposed”. “She was the first woman to win the Prime Ministership of the UK, and she took office at a critical moment in British history. The sun had long since set on the British Empire, and the country was quickly becoming an international laughingstock. Paul Johnson and other British literary lions have noted the disdain they encountered when discussing their English heritage during the late 1970s. 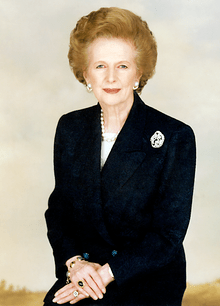 Mrs. Thatcher came to power 1½ years before Ronald Reagan won election as the US President, and she immediately began to implement her governing program. During that memorable eleven years, including smashing electoral victories in 1983 and 1987, Dame Margaret revived the British economy and then she took on and defeated Arthur Scargill and the coal miners union. In foreign matters she sent the storied British navy to slap down the impertinent Argentines in 1982, she worked closely with President Reagan (and indirectly with Pope John Paul II) in efforts to undermine and sink communism in Eastern Europe, and she continued to stand with the USA through the Cold war and beyond by sending British combat units to fight in the first Gulf War of 1990-91…. “Before Mrs Thatcher, universities were very similar to public utilities – run for the benefit of staff with government money. Now they are stellar,” said Professor Kealey. “She was determined to introduce a much higher level of accountability for public funding and greater accountability for students as customers,” he said. The introduction of full tuition fees for international students in 1981 was a good example of Baroness Thatcher’s benign legacy to higher education, he said. “It was condemned by almost everyone as a catastrophe for higher education when it was introduced,” he said. As an academic scientist, my first thought on Thatcher’s legacy relates to the university sector. The introduction, in 1986, of the first assessment of research had its roots in her unwillingness to trust anyone with anything unless it was centrally checked, and from it has grown an ever more burdensome attempt to quantify and rank university departments. This desire to check and control was manifest in her attitude to science itself. As secretary of state for education and science in 1971, she oversaw a change of policy in science funding that had, and has, far-reaching consequences. Government departments became “consumers” of the work that was to be commissioned by the various research councils: civilian research was expected to have utility in and of itself. Science was just there as a source of wealth creation. Over the following 20 years or so, control of scientists seems to have become a core strategy. There was a reduction in civilian scientific spend by the government. And what money there was had to be directed towards industrial needs, and industry (which meant large industry) was increasingly at the heart of the decision-making. Little room for unexpected innovations in a model like that. See an author’s opinion that Thatcher’s legacy is Britain’s isolation (FT, April 12, 2013) and that Thatcher’s “instincts were completely out of touch with modern Europe”…however, the author also expressed her admiration of Thatcher “as a woman who achieved power at the highest levels and demonstrated that she could wield it as well, or as ill, as any man”. “…in O Fiaich’s mind that day, nor mine today, that Thatcher’s ­intransigence drove many young men into the waiting arms of the IRA. She was one of the IRA’s best recruiters. She pushed the end of the war back at least 10 years and consigned a generation to conflict. Instead of seeking compromise, instead of learning from history, she thumbed her nose at it. When it was over, 10 men were dead of starvation in the H-Blocks, and many more died outside the prison walls in the rioting and recrimination that followed. Worse, Irish and British moderates were in no mood to accommodate each other. To her credit, Thatcher learned from her mistake, as did successive British governments, and there’s a Boston connection: US House Speaker Tip O’Neill. In 1981, Thatcher met with O Fiaich, because Irish republican prisoners were on hunger strike over Thatcher’s attempts to criminalize them by removing their political prisoner status. O Fiaich had helped avert a deadly hunger strike the previous year, but the republican prisoners ­accused Thatcher of reneging on promises, and Bobby Sands had launched what would prove to be a pivotal moment in the war in Northern Ireland. In the middle of what O Fiaich recalled as a lecture, Thatcher told him she believed the prisoners were determined to kill themselves in the most torturous way imaginable, by starving themselves to death, to prove how tough and virile they were. Hume persuaded O’Neill to prevail upon the guy who, besides her husband Denis, Thatcher loved most: ­Ronald Reagan. Hume told O’Neill who told President Reagan who told Thatcher that she had to work with the Irish, to show that nonviolent nationalism was the only way forward, and she did. The Anglo-Irish Agreement she signed in 1985 with Irish premier ­Garret FitzGerald led inexorably to the Good Friday Agreement of 1998, ending the war and ushering in a new era of Anglo-­Irish relations.